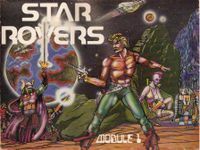 Star Rovers: The Ultimate Space Role Playing Game! THE FIRST STEP in your journey to the outer limits of your imagination! This introductory module fuses the worlds of science and fantasy to form a space/fantasy role playing game which is easily learned by beginners, yet gives the experienced gamer future worlds rich in technology, equipment, and danger. MODULE ONE CONTAINS over 130 pages of fully illustrated, easily-referenced rules, Starship Floorplans, Quick Reference Sheets, 5 Dice, a Mapboard of Moondog Maude's Cantina, Encounter Charts, a Time Line Chart of all ages and technologies, and everything you need to create and explore whole star systems. Journey with STAR ROVERS into the future and learn the incredible secrets that await you! 4-sheet plans of the Starship "Zyrconium Zephyr"
17"x22" Deck plan poster of the Starship "Zyrconium Zephyr"
17"x22" map of "Moondog Maude's Cantina"